Known as "the Robin Hood of poker" for donating sizeable tournament winnings to charity, Barry Greenstein is highly regarded in the poker world for his professionalism and honesty. Soon after the poker boom kicked off, Greenstein was given the opportunity to share some of his wisdom by contributing a section to Doyle Brunson's Super System 2. Instead he ended up creating a book of his own with " Ace on the River: An Advanced Poker Guide". "Ace on the River" is named after card which gave Greenstein the victory in the 2004 WPT Tunica event and is split into four parts. The first section is mostly a short autobiography, as Greenstein covers his history of playing cards from a kitchen table in Illinois to the high stakes games of Las Vegas. Then the book looks at his philosophy, which covers a range of subjects from what makes a winning player, effects on a player's personal life and broader thoughts on how gambling can fit into a productive society. Part three delves into the mathematics of poker and includes a few hand examples. The final part is more of an appendix which includes different hold'em charts, a glossary and acknowledgements. Greenstein fits a lot into this book. There is much aimed at helping experienced players who are looking to turn professional, or at least make an easy transition to a competitive live environment. Beginning and amateur players will also gain a fascinating insight into how a great poker mind works, and the considerations top pros have. Much of what Greenstein offers is good common-sense advice, which is explained superbly, and there are gems which many will not have considered before. At times though it can feel disjointed and you may wonder if the author has tried to squeeze too many subjects together. One thing that really stands out about "Ace on the River" is its look and feel. The book is packed with photos of famous poker players and the sights of Las Vegas, which re-creates the fantastic world which Greenstein has lived through. Both hardback and paperback versions are printed on glossy paper, which really helps to bring these images to life and making it a real coffee-table book. 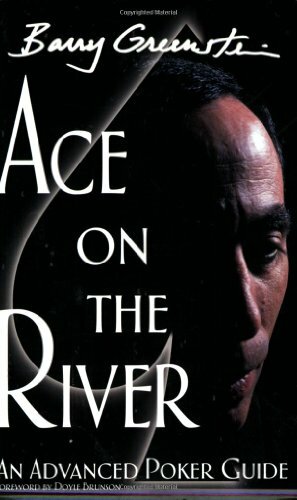 While it will not give you all Barry's secrets on beating particular games, if you are serious about playing poker, or just a fan of the game, "Ace on the River" is a book to add to your collection.